• From VENEZIA (VENICE) take Autostrada A4 till Padova, then A13 till Bologna, then A1 direction Milano till Parma, then in Parma take A15 to La Spezia, then A12 to Genova and exit at Carrodano-Levanto. Alternatively take A4 to Milano, then see from Milano. It takes 6 hours. • From LUCCA take Autostrada A11 to Viareggio then take Autostrada A12 till Genova and exit at Carrodano-Levanto. It takes 1 hour and 30 minutes. • From PISA take Autostrada A12 till Genova and exit at Carrodano-Levanto. It takes 1 hour and 30 minutes. From A12 exit of CARRODANO-LEVANTO follow signs to Levanto and Monterosso al mare. After Levanto follow signs up hill towards Monterosso. At the top of the hill you will drive to a short tunnel. 400 meters after it you will see a left turn uphill toward La Spezia, Pignone and Vernazza. Ignore it. Keep on the road you are on (it keeps going left) ignoring also the downhill turn to the right for Monterosso - Fegina. After 5 Km. you will be at a traffic circle at the beginning of the town, pass it a take the first on the right (you'll find a sign posted "Villa Steno") continue to the top. 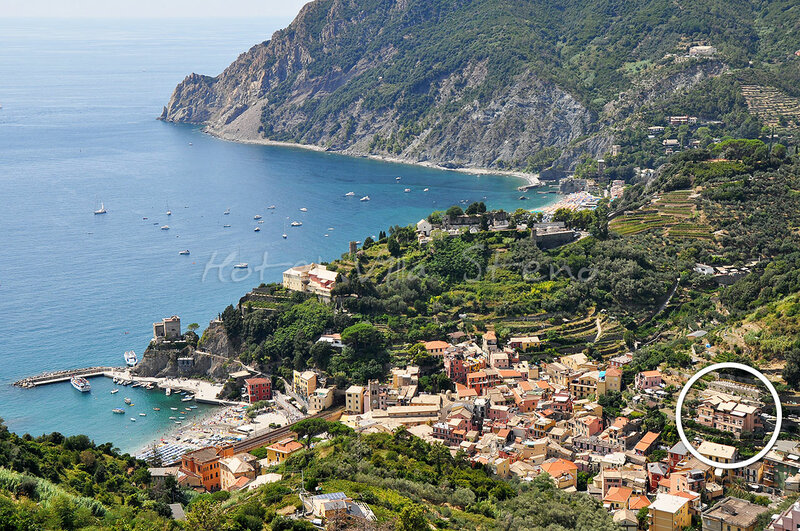 From March to November a gate will close cars access to Monterosso old town. If you find it open drive up to the hotel. If it is closed, please park your car and walk up to the hotel (2 minutes walk) and we will give you a card to open the gate, so you will be able to drive up and park your car at our parking. • Milan Malpensa Airport: 3h & 30 min. • Genoa: 1h. & 15 min. • Florence: 2h. & 30 min. • Pisa or Lucca: 1h. & 30 min. • Venice: 5h. & 30 min. • Siena: 3h. & 30 min. From the station to the hotel it takes 15 minutes walking (1 km. ), but the last part is steep. You can also take a taxi and it takes 5 minutes driving. In town we only have 3 taxies so if you want to take a taxi it is very important to book it calling us or sending us an email letting us know your train arrival time. Walking from Monterosso railway station: on exiting the railway station turn left along the sea front. After 300 meters pass through a short tunnel and under the railway bridge beyond this. Take via Roma (to the right of the arches of the church in front of you on the piazza) and continue for 200 meters until you pass a bank and then a post office on your left. 10 meters beyond this look for an uphill turning to the left sign posted Villa Steno, indicating your left, and continue to the top. • Milan: 2h. & 50 min. • Rome: 4h. & 30 min.